Great news for deaf and hard-of-hearing people, or those wanting to follow videos in other languages: you can now ask YouTubeâ„¢ to caption their videos automatically using a voice translation service. Currently this service is limited to a few channels (education and some Google channels), but it is planned to be expanded. 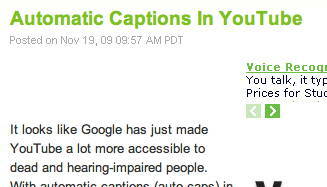 Users can search for text within captioned videos, which sounds a great idea. As if that wasn’t enough you can give a “raw” captioning, with no timing information, and let the service “align” the caption text to the audio track. I can imagine this will prove popular with adding song lyrics or movie/theatre scripts to the performances. I would imagine that those creating videos will be able to start with an automatic caption, then edit the captions if they contain any errors. I’m sure the dead people are thankful.